Thank you for choosing Telerik RadTimeSpanPicker! RadTimeSpanPicker is a UI component that provides a full control over picking a specific time span and duration using the built-in components for days, hours, minutes, seconds and milliseconds. You could easily define some minimum/maximum ranges and specific value step for the components. 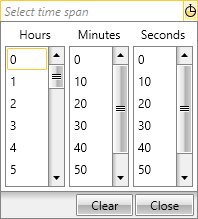 RadTimeSpanPicker also provides the ability to create custom components to meet any specific user scenarios. TimeSpanComponents - RadTimeSpanPicker supports built-in components for picking days, hours, minutes, seconds and milliseconds. A specific minimum/maximum ranges and value step could be set for each component separately. Styling and Appearance - You can easily customize the appearance of the control. Watermark - RadTimeSpanPicker allows the user to set a desired watermark content using the TimeSpanWatermarkContent property and modify it as needed using the TimeSpanWatermarkTemplate property. Events - Support of routed events and some specific for the control events. You can check RadTimeSpanPicker demos at: https://demos.telerik.com/wpf.